Today was Mum’s birthday. I was up exceedingly early to do the minutes from last night's meeting and then, with Rachel to go to Pearsons to collect the plants which we wanted to set out in a planter for Mum’s window to go along with the glass panel which Rachel had made. We also saw a glass butterfly which changes colour in the dark after it is charged up by the sunshine. We bought one as a wee piece of nonsense and, as so often happens, butterflies became the theme of the day, appearing on so many cards and envelopes and even on the birthday cake later in the day. However, I’m getting ahead of myself. 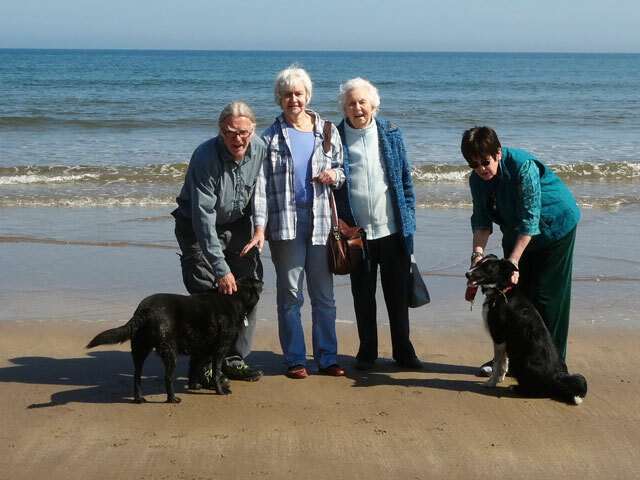 We all set off to visit Berwick – Mum, Rachel, Olive and Digger, the three dogs and I. It was a glorious day and our first port of call was to HomeBase so that Mum could buy a lampshade for her bedroom. We explored Homebase and admired the summer garden furniture which is now appearing in the shop. From here we all went down to a beach which Rachel has found. It is quiet and extremely beautiful and Mum enjoyed walking on the beach right out to the water’s edge (as did Rowan, Heidi and Mix). The sun shone and it was a wonderful morning. Rachel then set off for home taking the three dogs while the rest of us, in Digger’s car, went off to the Berwick Garden Centre which we explored (more wonderful garden furniture) until Rachel returned without the dogs and we all had lunch together. By now we were well into the afternoon so we made our way home and pottered until it was time for a birthday evening meal for which we were joined by Scott and Sue who brought the birthday cake with its theme of butterflies. We talked into the evening. It was a splendid occasion.